Watercolor Works: My Garden is Blooming! We had a long, cool spring this year and my garden seemed to love it. Here is one view. 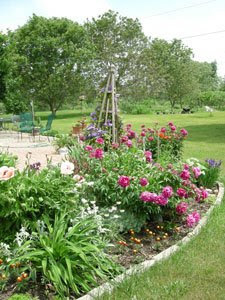 You can see pink poppies, orange poppies, clematis, miniature iris, lambs ear, peonies, marigolds and lots of others. Gardening and painting are so very similar. Both ventures require planning, composition, color, texture, and lots of hard work. This particular garden is about seven years old now and has really become a joy! I am looking forward to the Franklin Garden Walk this Wednesday where I will be painting in a garden. Come visit me if you can. The walk runs from 10 am to 3 pm, then again in the evening. For more information visit the events page on my website and scroll down to the Franklin Garden Walk. Click here for more information.